Steep Roofs In Dallas, TX - Repairs, Installation And Maintenance! Steep roofs are a stylish choice for homeowners these days. They also provide the benefits of better drainage and a little more indoor space. However, they also come with their challenges, particularly if you need any sort of roofing work. Steep roofs require particular safety protocol for any repairs, replacements, maintenance or installations due to the increased danger of falling. It’s important to hire roofers who can safely work with your steep roof. The pros at Eclat Roofing are trained in working safely and effectively with Dallas, TX steep roofs. Call us today at (214) 373-1500 for your residential roofing service! 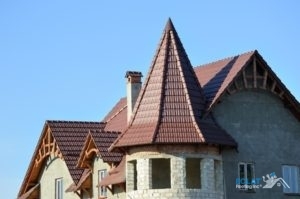 Steep roofs can be achieved with clay tiles, concrete tiles, imitation tiles, composition shingles, metal, wood, and hail resistant materials! With a steep roof, up to 40% of your roof will be visible from the ground, so whatever material you choose will really show. Eclat Roofing is the best choice for steep roofs installations. Since 1999, we’ve served the DFW area with the best roofing services, and we are always learning about advances in the roofing industry! Unfortunately, damage to steep roofs really shows since so much of the roof is visible. Repairs are necessary from both an aesthetic and a structural standpoint. Whether you’re missing shingles or you’re experiencing a leak, we can take care of it quickly! It’s important to the life of your roof that any repairs are made quickly to avoid extensive damage. Our roofers can safely and effectively provide maintenance for your steep roof. This is especially important after hail and storms, which can deteriorate roofs. Catching and remedying any problems with maintenance will cost much less earlier rather than later. Eclat Roofing exists to provide 100% customer satisfaction to homeowners in the DFW area and beyond! Texas may be our home base, but we can also do work in Louisiana and Oklahoma. We are the top roofing contractor for repairs and maintenance for Dallas, TX steep roofs. We invite you to read our reviews and contact our references before we begin your roofing project. Call us today at (214) 373-1500 to begin your steep roof maintenance or installation! Updated on September 13, 2018 at 3:15 pm by Eclat Roofing.